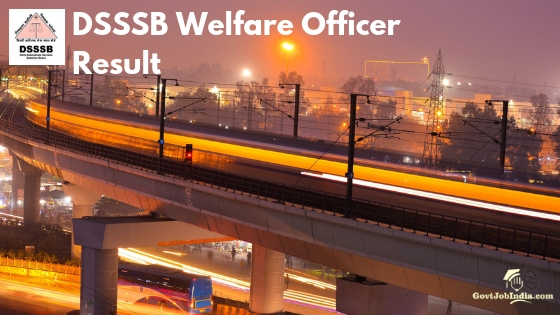 DSSSB Welfare Officer Result: Applicants can check their DSSSB Welfare Officer Result 2019 along with other posts for both Tier 1 and 2 examination right here. They will be officially declared by the state commission website @ delhi.gov.in. As declared by the authority there will be 2 tests, Tier 1 and Tier 2 respectively. Tier 1 is a selection phase to appear for Tier 2 test. A skill test or endurance test will be set wherever required. Skill test and endurance test will be for posts like Stenographer etc. Accordingly, the candidates will receive notifications from the recruitment board. Moreover, we will keep adding all the latest details as well as updates right here. Please bookmark the page. The official Delhi Subordinate Services Selection Board website @ delhi.gov.in will announce DSSSB Result 2019 for Welfare Officer and other posts. The DSSSB Merit List 2019 will also be announced at the same website. There are total of 204 vacancies with 7 various posts. A recruitment table is mentioned below with brief details on vacancy and name of all the 7 posts declared. Applicants are requested to go through the article carefully. A direct link to check result is attached below. As soon as the results or final merit list is announced you can simply click on the link. Minimum qualifying marks vary for categories. The same is also mentioned below. Meanwhile, kindly read the official Pdf carefully. It has all that you need to know about recruitment as well as result. Selection method for all the 204 vacancies includes 2 examinations and a skill test if required. Tier 1 would be the selection round for Tier 2 examination. Marks obtained in Tier 2 examination will be considered for the final list of applicants. Kindly check the recruitment advertisement Pdf to know more about the examination scheme. Criteria of negative marking is set as 0.25 for every incorrect answer. Examination centers for both the tests would be Delhi NCR only. Changes and modifications might be made on locations based on vacancies. If so, applicants will be notified. DSSSB Welfare Officer Result 2019 will soon be declared after respective examinations are conducted. Important dates and path to check DSSSB Merit List are all provided below. Please check the “How to check result online” carefully. The steps will help you check particular result based on the vacancy you have applied for. Or you can simply click on the direct link attached. The link will take you to the page where you can see the advertisement. Check that the result or final list matches with the post you have applied for. Notifications regarding skill test will be declared after result. They will also be added right here. Do not forget to bookmark the page. How to check DSSSB Welfare Officer Result 2019 Online? On the homepage of official DSSSB website @ delhi.gov.in there are several options available. Please proceed towards employment/business section and click on “Recruitment”. A separate web page will open. Check the left side of the page for “Result” option. Click on “Result” and then select “Latest Results”. In the section of “Latest Results” look for Welfare Officer or the post you have applied for. On the same section where you find result is another option for “Mark List”. Please also check the “Mark List” section for selection list. We believe you were able to know all the important details regarding DSSSB Result 2019. Please feel free to let us know if there are any questions or doubts in the comment section below. A response to all your doubts will be given my our team as soon as possible. To receive more updates and notifications regarding job opportunities with Government of India, please check our website @ govtjobindia.com. There are also options to subscribe so you do not miss the latest opportunities. All the best!